Interdisciplinary graduate programs offer exciting opportunities for faculty and students to come together across traditional divides to produce cutting-edge research and scholarship. 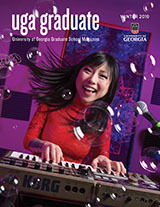 The Graduate School is committed to enhancing the culture of innovation and interdisciplinarity in graduate education at UGA. The videos of the 2015 3MT finalists are now available online!